English muffins and bread are grain products that have similar nutritional value. They might look different and be prepared differently, but they belong to the same food group and are a good source of carbohydrates. Today, there are several varieties of breads and English muffins; some are made with whole grains, raisins and cinnamon or plain white flour. Whole grain breads and muffins supply more fiber, contributing to health benefits such as a reduced risk of diabetes, stroke and heart disease, according to The Whole Grain Council. Check the labels and compare the variety of English muffins to the same variety of breads. English muffins are not like the quick bread muffins that you see in the bakeries and grocery stores. Those muffins are made with baking soda or baking powder and come in flavors such as banana, chocolate, poppy seed and blueberry. English muffins are a yeast bread, cooked on a cast iron griddle. They originated in Wales in the 10th century and were considered the fare of the lower class, according to The Jane Austin Centre. By the 19th century they became popular at tea and were sold throughout England and Wales. English muffins are quick baking and have simple ingredients of flour, yeast, salt, water or milk and a little sugar. The dough is mixed up, left to rise and then shaped into the traditional round shape and left to rise once more. Light and fluffy, the muffins are baked on a hot griddle, turning to brown each side. 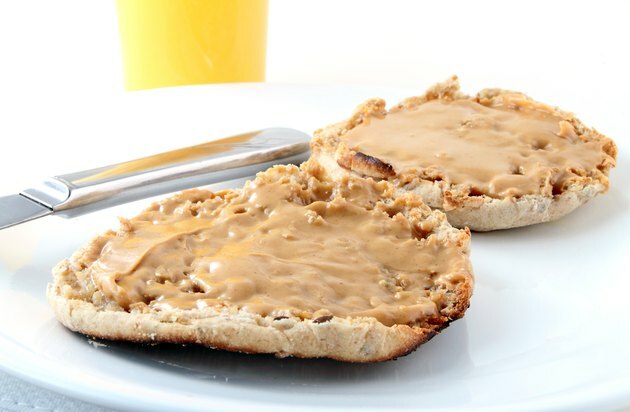 Today, English muffins are also made with whole grain flours to improve their nutrition. Yeast breads are traditionally made into loaves and either sliced for sandwiches or left whole for a more rustic, crusty bread. There are many varieties of bread, including sourdough, french, whole wheat, rye, pumpernickel, white, raisin and multigrain. Each of these breads vary in nutritional content based on the ingredients. The basic ingredients are the same as those for English muffins: yeast, flour, water and salt. Some bread recipes may add oil, eggs and sweeteners such as molasses or honey. Compare the nutrition of white bread to white flour English muffins or whole wheat bread to whole wheat English muffins. Two slices of bread approximate the same amount as one English muffin. Two slices of white bread, weighing 56 grams, contain 158 calories, 5 grams of protein, 1.68 grams of fat, 27.4 grams of carbohydrate, 1.6 grams of fiber and 2.8 grams of sugar, according to the U.S. Department of Agriculture Nutrient Database. One English muffin, weighing 57 grams and prepared with white flour, contains 134 calories, 4.39 grams of protein, 1 gram of fat, 26.22 grams of carbohydrate and 1.5 grams of fiber. The nutrition is essentially equal. Whole wheat bread and whole wheat muffins have the same nutrients, but both contain more fiber, approximately 4.4 grams. If you have allergies to wheat gluten or other grain allergies, do not eat English muffins or bread, according to the MayoClinic.com. Compare the labels for ingredients and nutritional content. Breads and English muffins have a short shelf life. If not used within a few days, store in the refrigerator or freezer. English muffins are best served toasted. This has no effect on the nutritional content. But some of your favorite toppings and butter will change the nutrient values and add calories. What Is the Difference Between Muesli & Granola?